Samuel Perry Jacks (1915-75) is recognized for inventing ringette, a game played on ice using sticks and a rubber ring. His family emigrated to Canada when he was only five years old. He began his work in recreation as the Assistant Physical Director at the West End YMCA in Toronto. He also developed the game of floor hockey in 1936. In 1948, he was appointed the first Director of Recreation for North Bay and dedicated his time to sport in the community. Jacks began developing the game of ringette in 1963, but before it took off as a sport, he died in 1975. 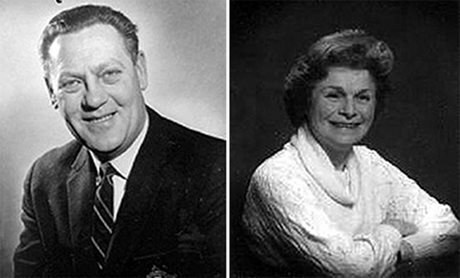 His wife Agnes (1923-2005) took over the organization of the game and, for her enthusiastic dedication to ringette and work in the sport community, she was named to the Order of Canada in 2002. Learn more about the sport of ringette on the Ontario Ringette Association website. Listen to a CBC Radio news story, Celebrating 50 Years of Ringette, which includes an interview with Agnes and Sam Jacks’ son Bruce. Read more about Sam Jacks on the Canada’s Sports Hall of Fame website.